And… That’s a wrap for Halloween 2016! This was the first year that there were no no-shows, so thank you to my clients – and the ones who called to cancel. It made planning my day and filling open spots so much easier! 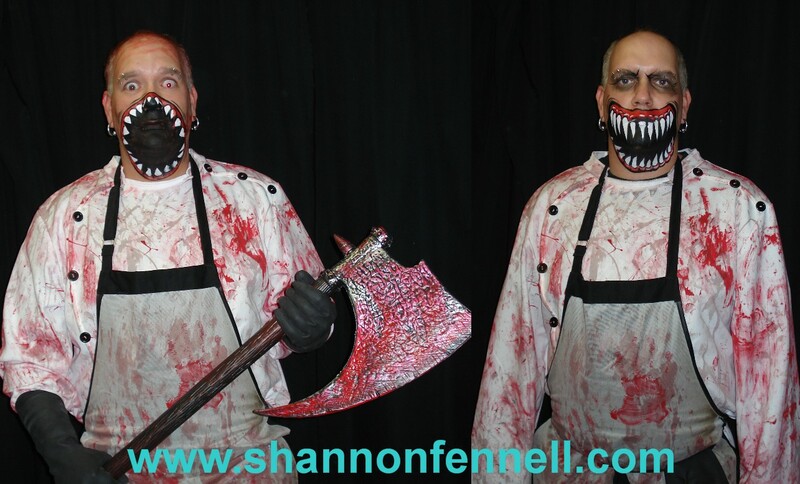 My first appointments this year were on Thursday afternoon, then all through the day Friday, solid on Saturday until 10 p.m. – thankfully Sunday was free from appointments but spent prepping for a special effects job – and then Monday, Halloween, with more bookings. There were a lot of skulls. Every year there are skulls. This year most of what I did was skulls… sugar skulls, half-skulls, full skulls, demonic skulls… with a few other things. 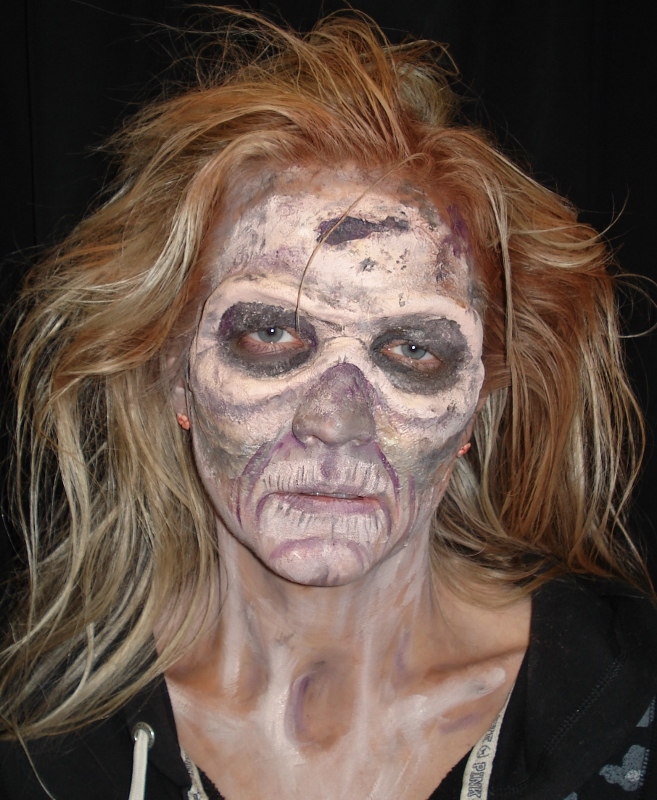 And one special effects zombie. Five years ago it was the other way around – lots of special effects zombies and a couple skulls. Guess tastes change. Or overexposure on social media. So here is a selection of what I did this year. 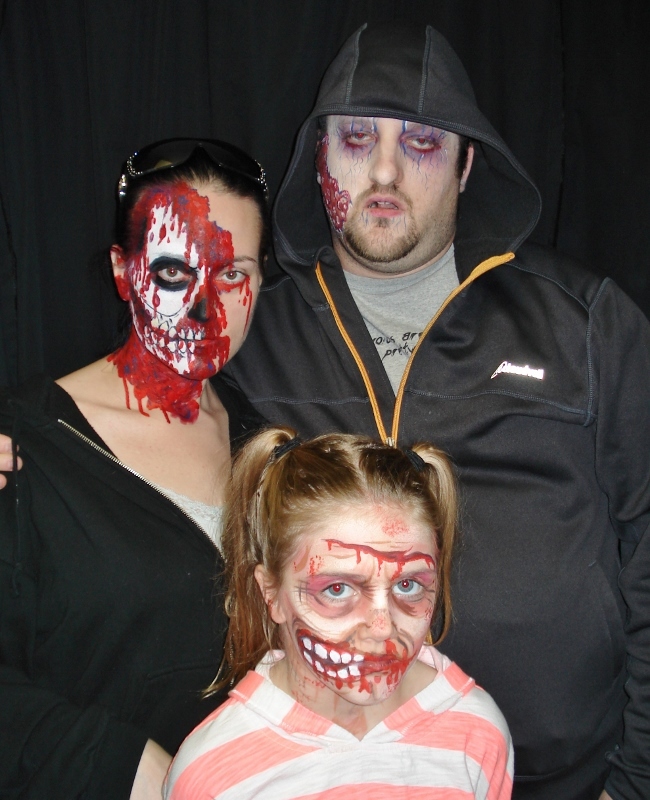 These next ones were a few of the ones done at at Muskoseepi Park for their annual Halloween Spooktacular. And the last one to share today, a little raccoon ready for trick-or-treating! 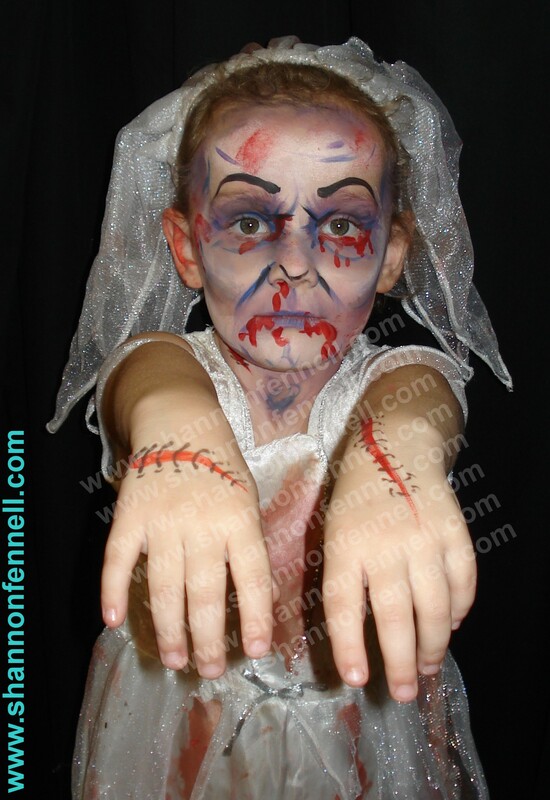 Categories: Costumes, Face Painting, Face Painting Designs, Halloween costume, Make-Up Artist, Seasonal and Holiday Face Painting, Shannon Fennell | Tags: Halloween, Halloween Face Painting, halloween make-up | Permalink. My first Halloween clients of the year were tonight. And I put my Mummy up in the window. Another client dropped off his prosthetics so I can get them painted and prepped for Halloween Day. Tomorrow my first appointment is at 7:15 a.m.
Saturday is fully booked at this moment. That seems to be fluid though as Saturday has been fully booked about four different times since the end of September, then I’ll have a couple clients cancel, fill-up the spots, repeat… LOL. A wait-list has now been started. 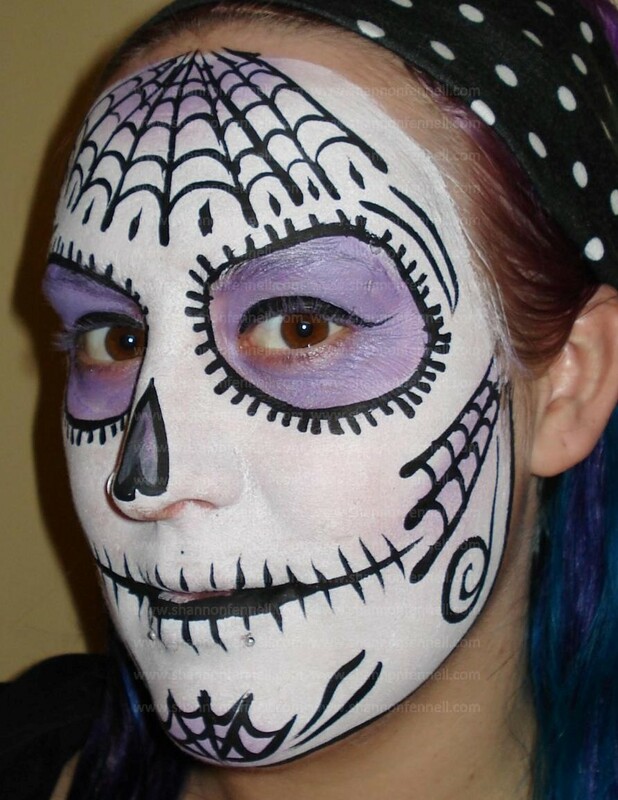 Skulls are the most popular request so far – both the Day of the Dead variety and the skeletal ones. I acquired a great piece of artwork today – a friend is doing a drawing a day and this was her work from yesterday. I loved it so I bought it! Framed and hung it in my studio this afternoon so she is on the wall to supervise all the skulls I will be painting this weekend! My studio is all set-up and organized, including a photo backdrop. I am ready! Bring it on Halloween! 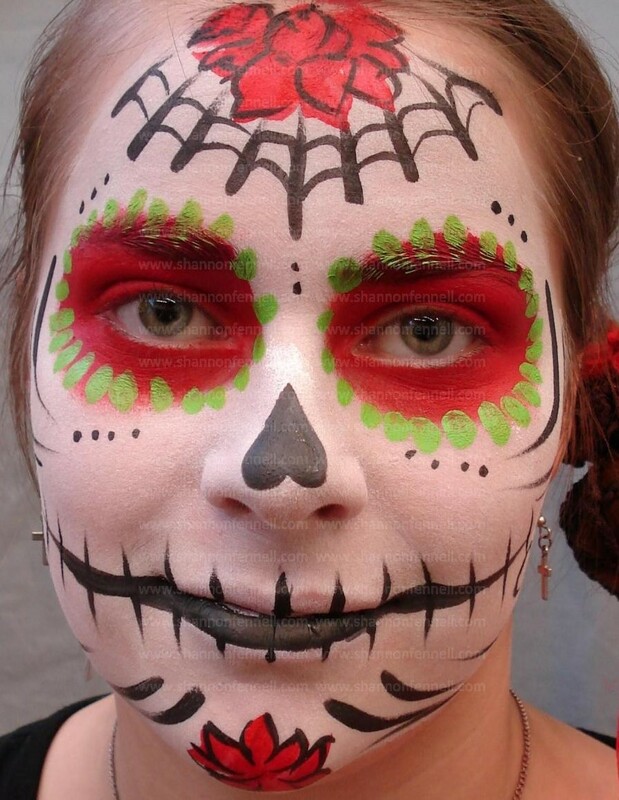 Categories: Art, Face Painting, Make-Up Artist, Seasonal and Holiday Face Painting, Shannon Fennell | Tags: Halloween, halloween make-up, sugar skull | Permalink. This weekend is going to busy, busy, busy! The party night, which is when my services are in the most demand, is Saturday. 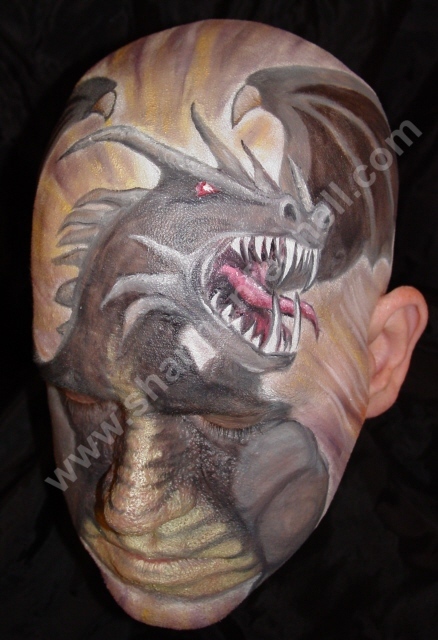 As Halloween is actually next Monday, the bookings on that day are kids on their way to school and my regular special effects client in the early morning. This year I have appointments booked on Friday, Saturday, Sunday and Monday. As always, it is a tiring weekend, but I look forward to it every year. I am booked solid on Saturday but there are always cancellations at the last minute – and unfortunately no-shows. I keep a waitlist and will call people if a spot opens up, so you can still contact me (message me through my Facebook page which is linked to on the right.) I just can’t guarantee you will get in. 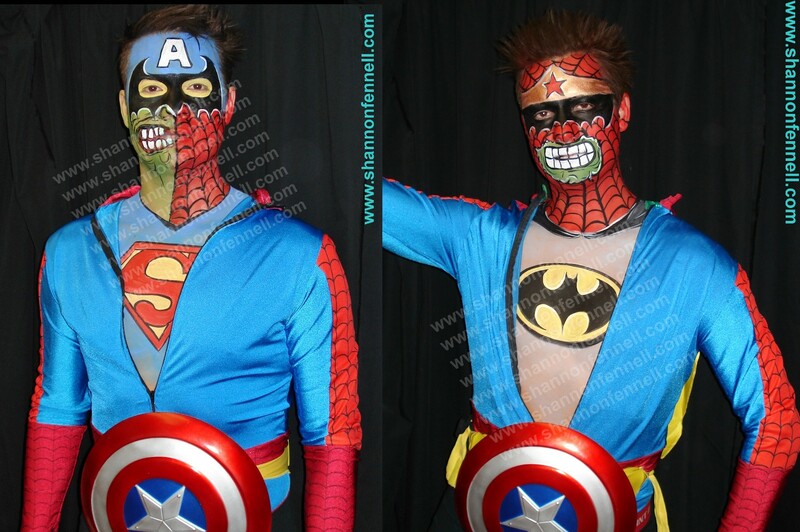 Here are some of my favourite costumes and make-up design combinations. Next week’s post will be all about what I did this year for Halloween, so stay tuned. 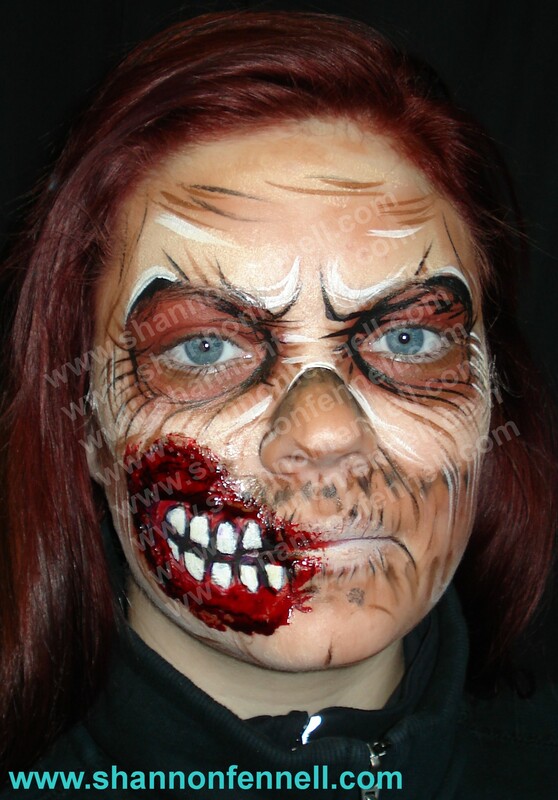 Categories: Face Painting, Face Painting Designs, Halloween costume, Make-Up Artist, Seasonal and Holiday Face Painting, Shannon Fennell, special effects make-up, Theatre Make-Up | Tags: Halloween Costumes, Halloween Face Painting, halloween make-up | Permalink. 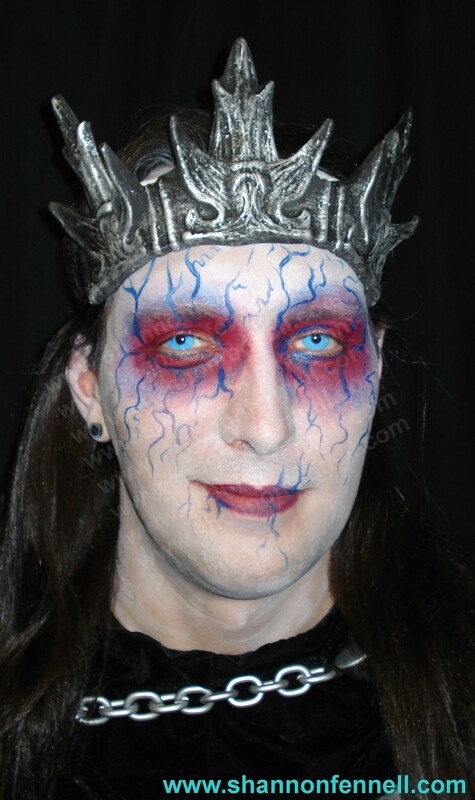 Here we are at the second week of my Halloween countdown in the form of some of my make-up and costume work. 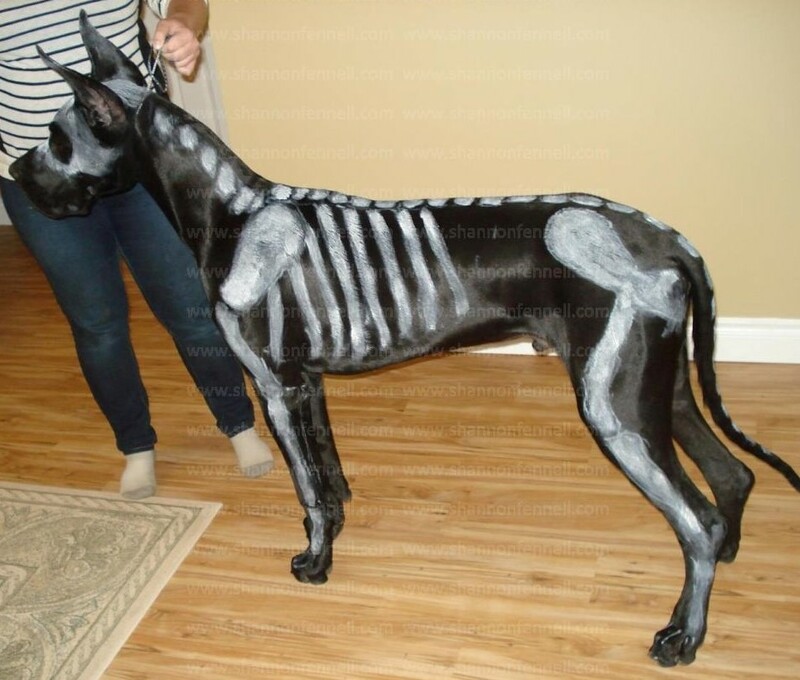 I love Halloween and those clients who want to go all out with their ideas. 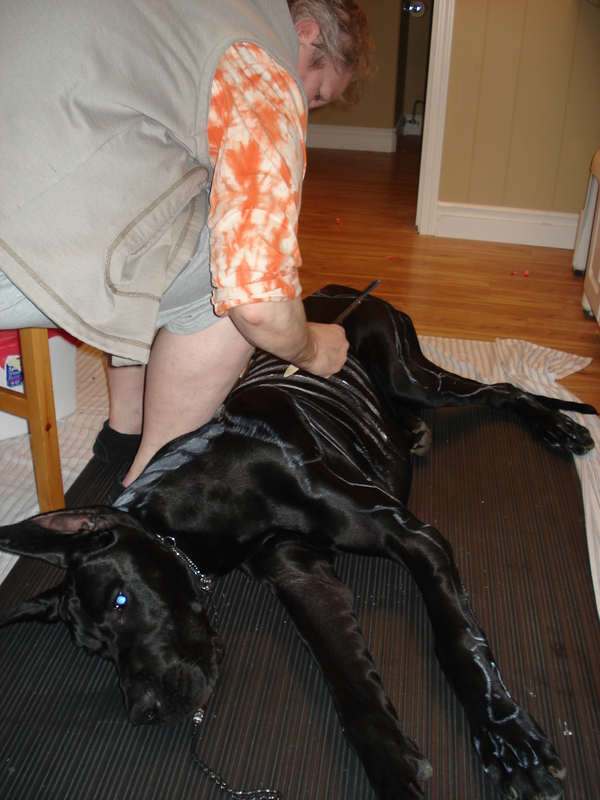 I’ve one particular client who comes every year, many years twice, who is the epitome of Halloween spirit. He gets a full special effects make-up every Halloween day morning and goes out for the day, often completely decorating his truck as well. 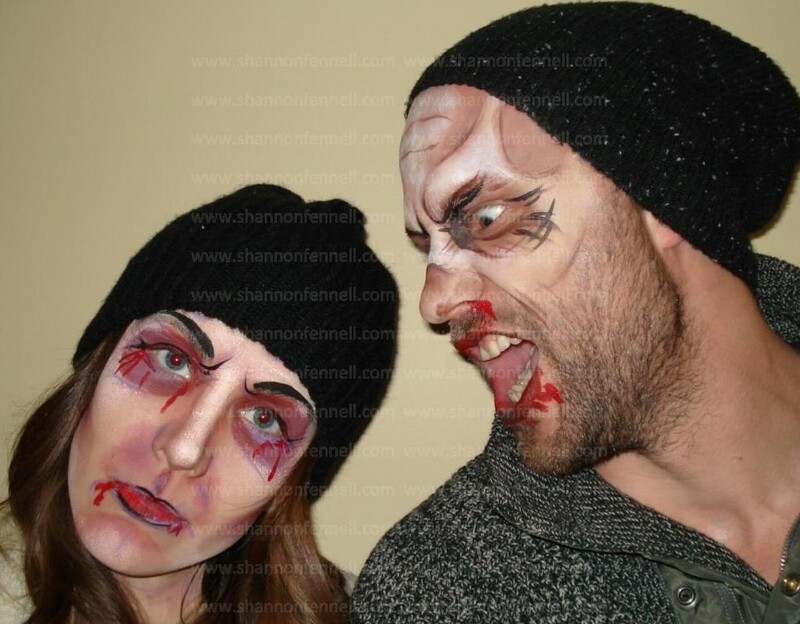 He has the idea and gets his costume together, and I get the make-up figured out to his specifications – sometimes I make the pieces, sometimes he buys them, sometimes both are used. Copious amounts of blood are usually involved. I have such a lot of fun with my clients! 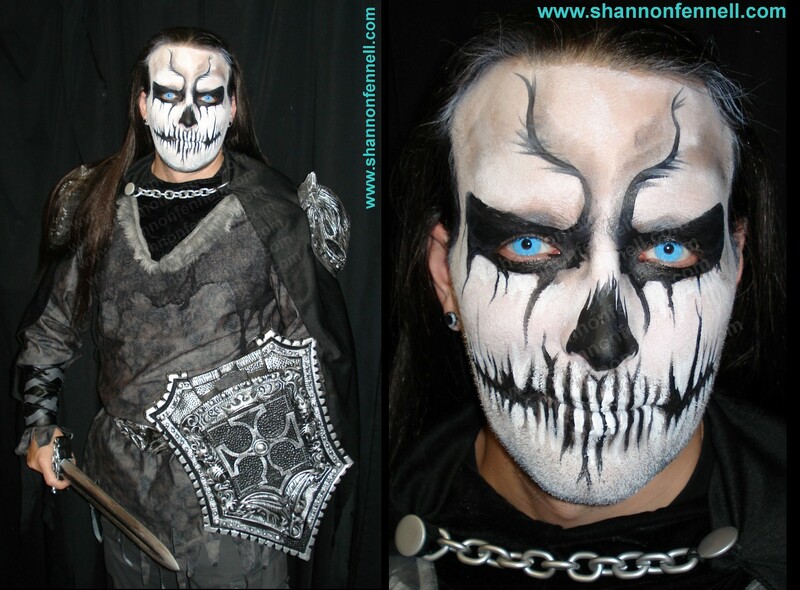 Categories: Costumes, Face Painting, Halloween costume, Make-Up Artist, Shannon Fennell, special effects make-up | Tags: halloween make-up, special effects make-up | Permalink. Another Halloween under the belt. Lots of great customers as usual. And a couple of no-shows. I don’t require deposits for private appointments, I just ask people to let me know they are not going to come so I can fill the time from the wait list… No shows don’t give me time to let people on the wait list know about openings. 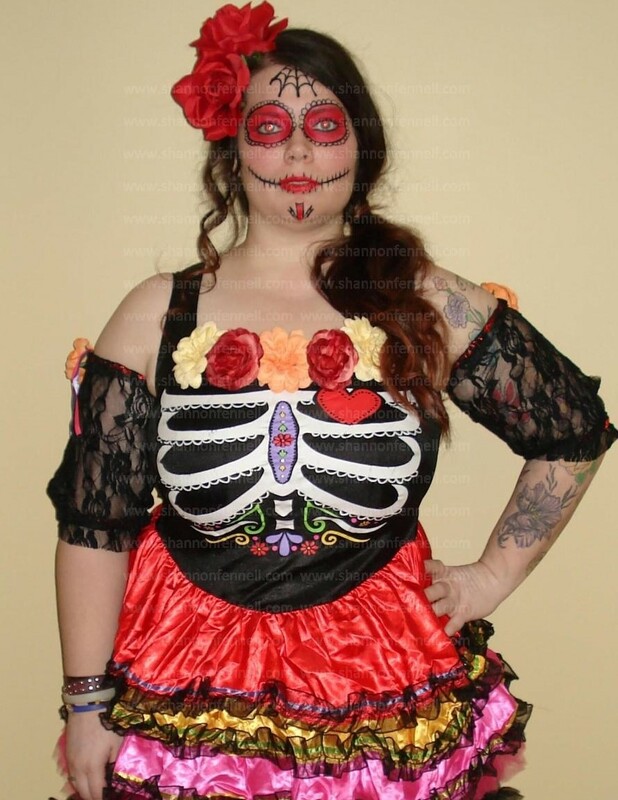 Sugar Skulls were huge this year. I did eight of them over the two days. What happened to the zombies?? 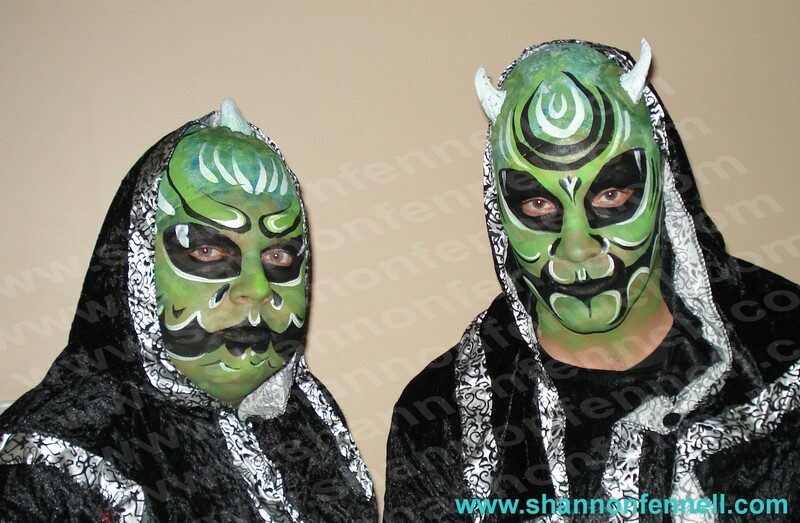 I only got to do three this year and they were face paint only, no sfx. 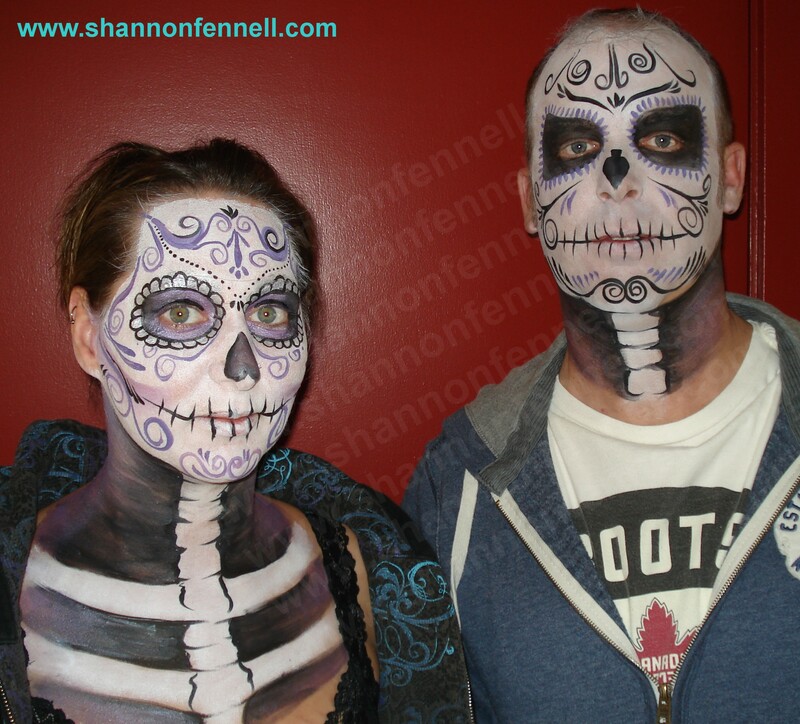 Here are some of the sugar skulls – I missed getting photos of all of them. I always manage to miss some even though I intend to take photos of everything. 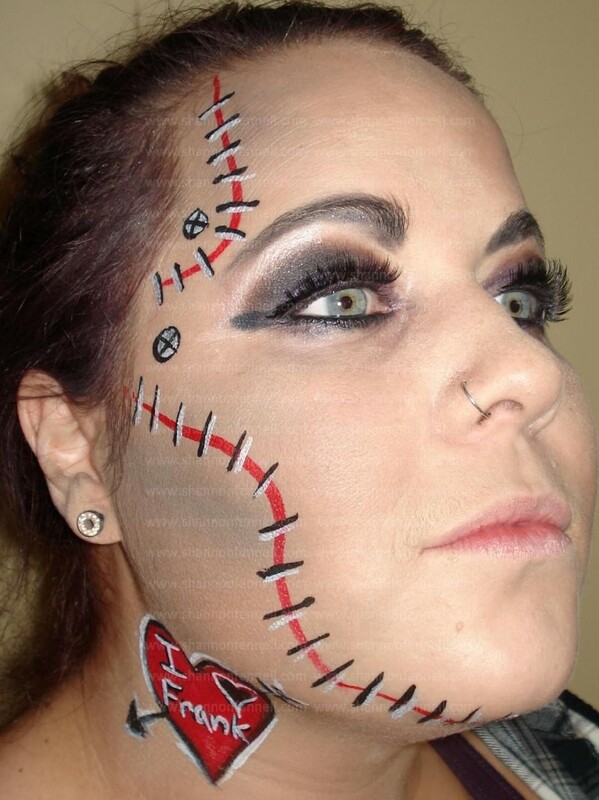 And these were minimally my work – they came with their bases already done and just wanted me to add the stitches. 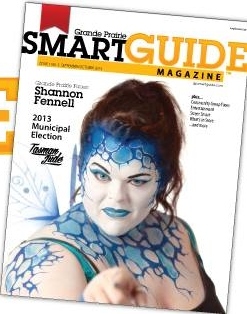 I did the eye shadow on the blue haired woman but her lash extensions were already blue. 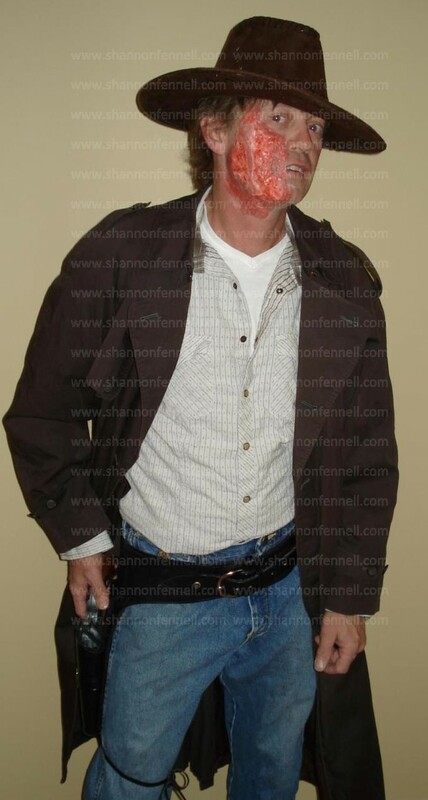 This next one is my interpretation of Jonah Hex (when the client told me that’s what he wanted I had to google it…) It was all created directly on his face and the latex and gelatin was reinforced so that he could remove it and re-attach it himself. 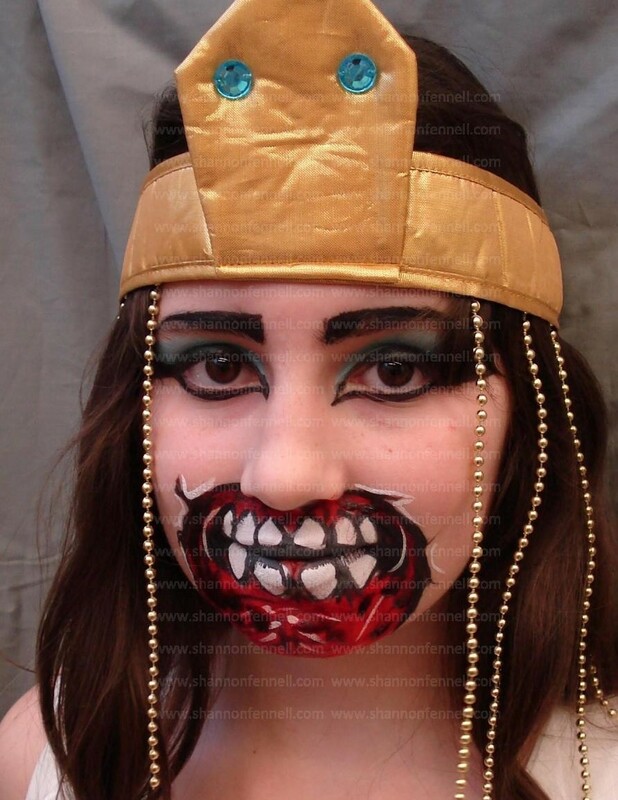 Next is Zombie Cleopatra – she really only wanted to be Cleopatra but she was working at a Haunted House and the “boss” told her she could wash off the “blood” later to go to her party. A couple of the Living Dead. And Vinny… ah, yes, Vinny the imaginative. He is the “Incy-Vincy Spider”… he is so creative. He always arrives with parts of his costume in pieces and finishes it in my studio. Usually I am picking up feathers and fluff for weeks. But it is always fun to get the make-up right. And my final photo to share is of Flynn, The Undead Dane! I’ve painted animals before but Flynn was unique – and massive… and heavy! 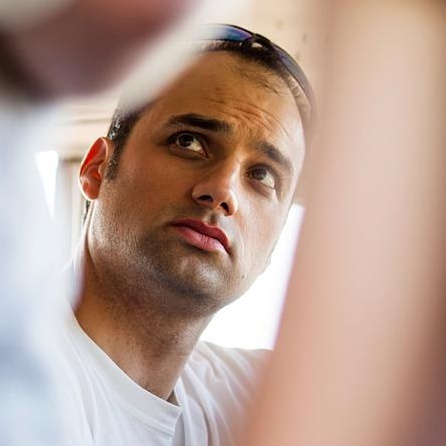 Here is an action shot… of me. On Flynn’s part it is inaction! 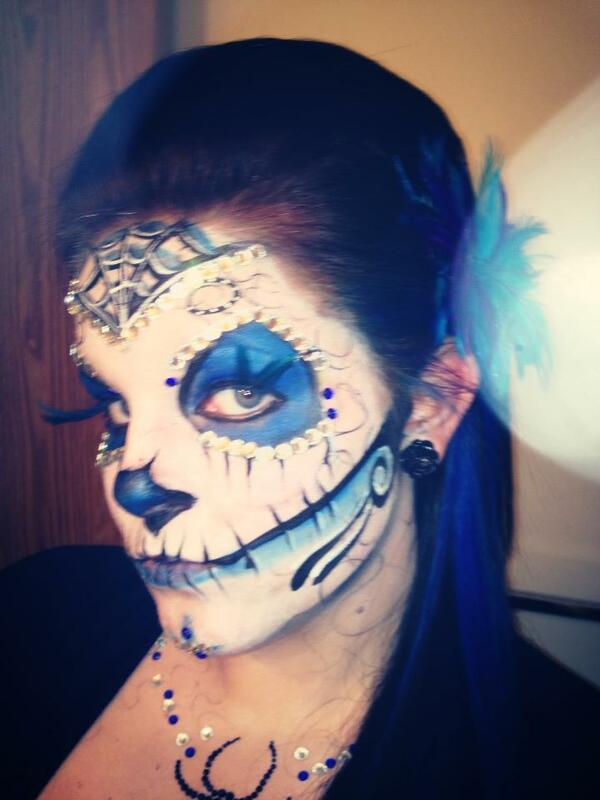 Categories: Shannon Fennell | Tags: halloween make-up, sugar skull | Permalink. Halloween season this year was a long one, not that I’m complaining! Well… maybe a little because my back and feet are killing me. 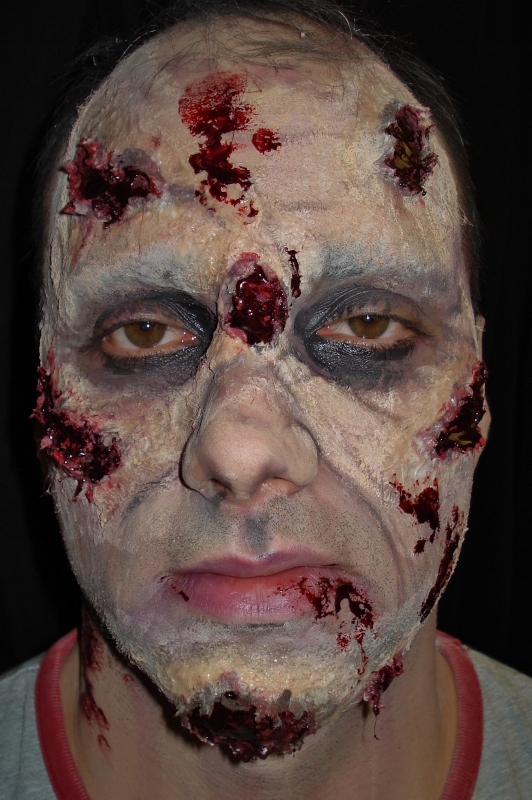 My Halloween bookings started on October 19th with four appointments, then I did a couple of full zombies for a film shoot the next day. The 25th I had bookings in the evening, then on Saturday the 26th I did my usual gig painting up the staff and haunters for the local park’s Haunted House, then back home for appointments well into the evening, then had evening bookings during the week, worked at the museum the evening of the 30th for four hours at an event, appointments all day on Oct 31st, from 2 pm on on Nov 1st, and finally, four more appointments the evening of Nov 2nd. That was a LONG stretch of bookings. And, I had eight (yes, EIGHT) customers who came for make-up TWICE… and one of them actually came THREE TIMES!! It was a very nice financial boost to the household. I’ve always thought it would be great to be able to do this full-time, I love make-up application and creating characters… but physically, well, I’m getting too old for this … I was in severe pain at the end of the long days and had to take a couple of Aleve AND a couple of Tylenol just to be able to stop the pain enough to sleep. I can face the short busy periods of standing and leaning to do make-up but I wouldn’t survive a regular day to day routine of it. Oh to be young again, eh? I love Halloween – I’ve got some excellent customers who book every year. 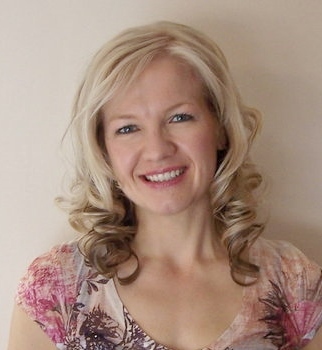 Most of my business is repeat customers… and I think 2014 is already booked solid. I already have confirmed in writing appointments for next year. This first one is based on the cover photo of Becstar Anthony’s book. My customer loved it (she saw it on my blog!) This is based on that design, with changes! 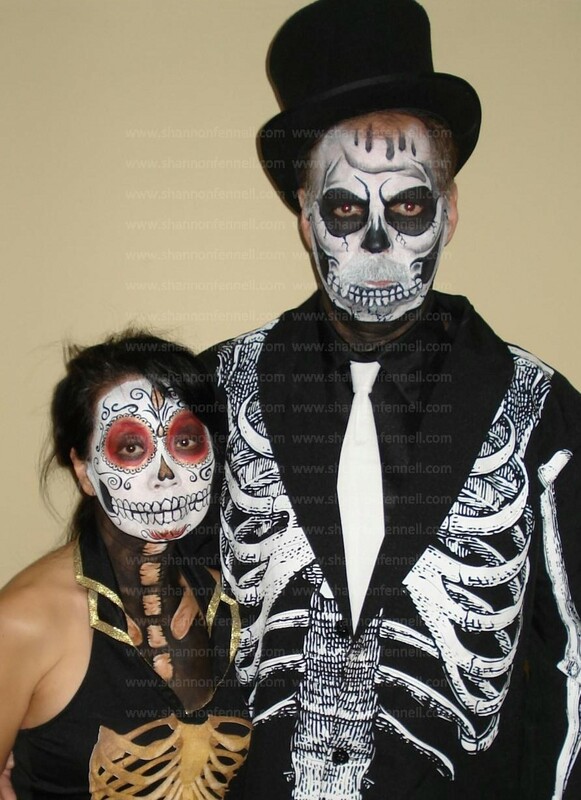 This next couple also wanted sugar skulls… they had photos but I didn’t really follow the designs. They had a variety of photos so I chose bits from one, something from another, etc. They promised to send a photo in costume… I’ll post it when I get it. 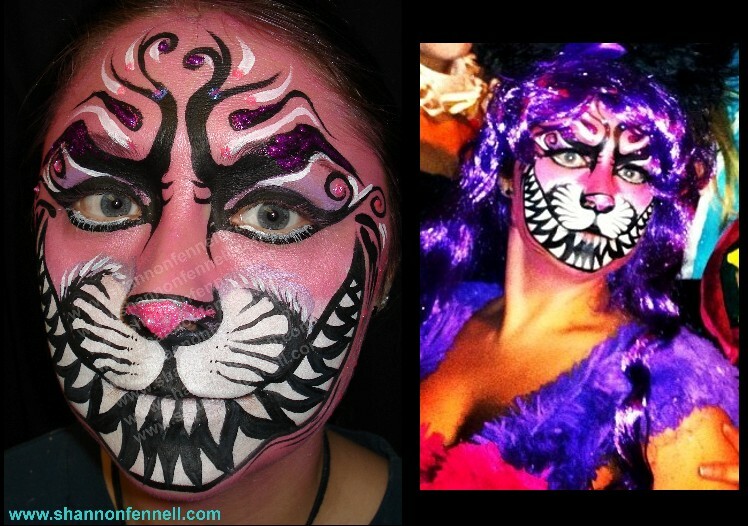 This next one is my interpretation of the Cheshire Cat – she wanted the big mouth full of teeth and to look fierce… she was going out with a group all dressed as Alice In Wonderland characters. This next one, I have to admit was one of my favourites – he had a couple of photos and wanted the overall look of one with the mouth of the other… I think it works amazingly well with the costume! And those eyes!! This customer had photos of the large mouth… the first one was the first time he came and wanted it like the photos he had provided, the second is based on a mouth design I found that I liked better and he chose that for the second time around. The three above guys then went to the Mall on Halloween Day and terrorized the little kids… just by being there! 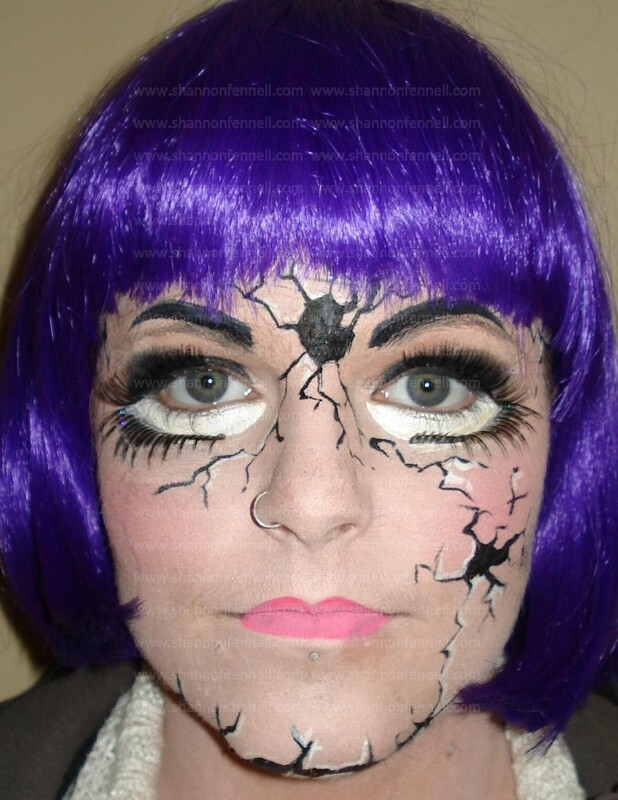 This next one is a repeat customer – she works at a Haunted House/Event each year and comes to me for the make-up. 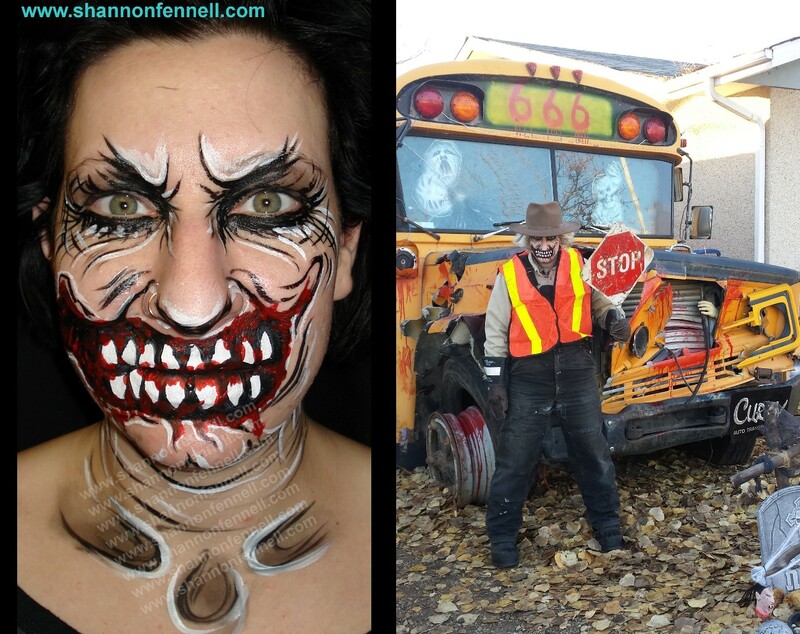 This year was a Zombie Crossing Guard – She sent me the photo in costume “on set” which is pretty cool! I deliberately used the black as she was going to be working outside and it would be dark for most of the event and we wanted it to show up. 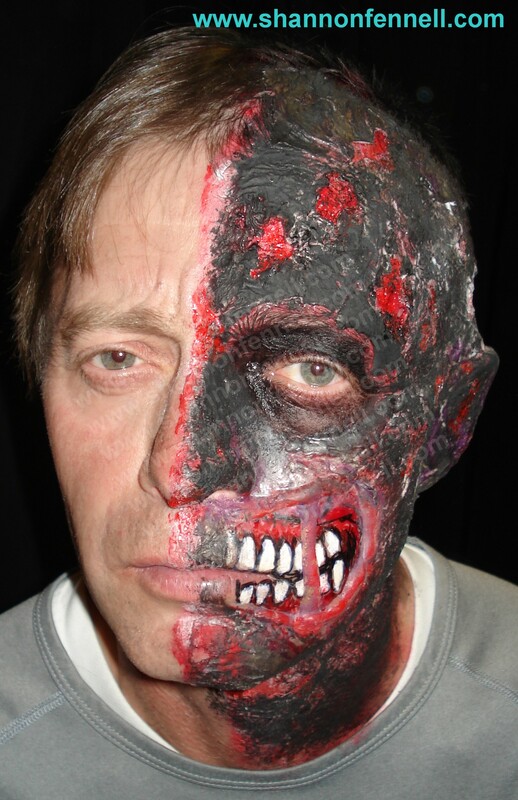 The next is my version of Two-Face from whichever Batman movie had Aaron Eckhart in it. I think it turned out pretty well. This customer came back the next weekend to get it done again for another party. 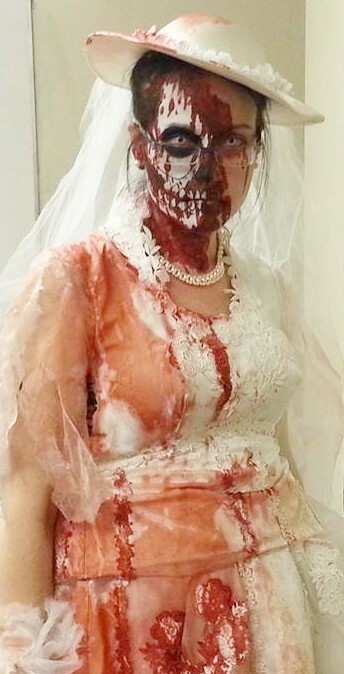 Here is a Zombie Bride – she was one of the customers who came twice this year. 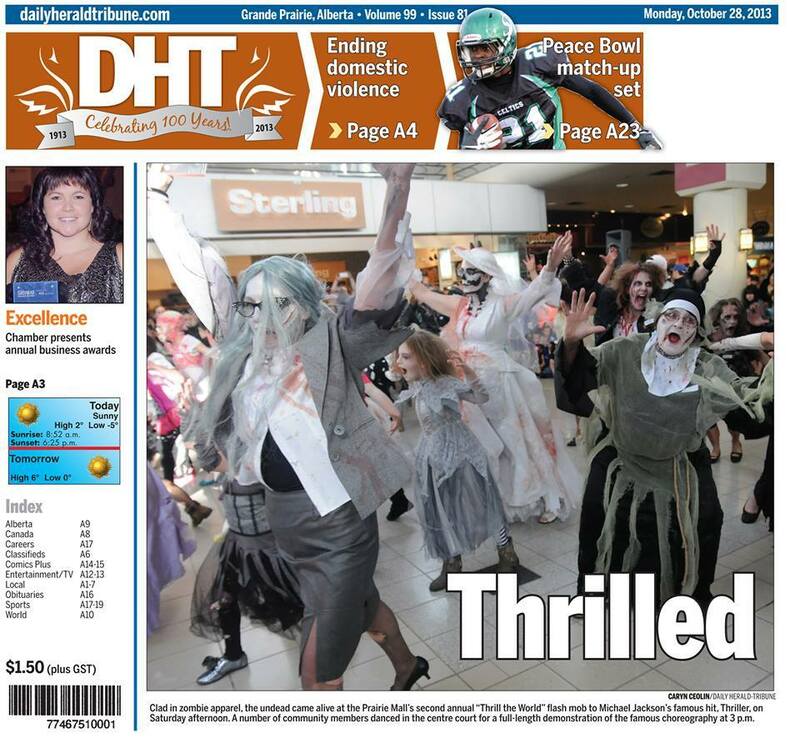 The second time we did a skull and rib cage design and she made the front page of the paper as part of the Thriller dance mob. Next, two green aliens… They bought their own bald caps, ears and horns… cheap ones… I pre-painted the ears and bald caps in advance. Due to the, er, lack of acreage of the bald caps I only glued them down on the foreheads, cut around the ears so they would lie flat and since they were wearing hoods the loose backs wouldn’t matter. The horns were glued onto the bald caps once I had them secured. They ended up not wearing the ears (they were not able to be attached – the kind you just fit over your own ear and wouldn’t stay.) I wish I had noticed the undone hood on the taller guy before taking the photo though. And last, but certainly NOT least… Comic-Con Man!!! Vinny came two times (hence the two different designs) and I painted his chest as well as his face – so the Superman and Batman emblems I painted freehand – I had to get Vinny to bring up the Superman “s” on his smartphone, but Batman was freehand from memory (there are so many versions of that!) His costume was a Spidey suit on backwards, Captain America’s shield on Batman’s utility belt, Wonder Woman’s boots and bracelets, Catwoman’s ears and tail. The design on the left was my idea – he arrived in his costume and I quickly sketched out my idea, the design on the right was to his specifications. So that is just SOME of what I did this season. 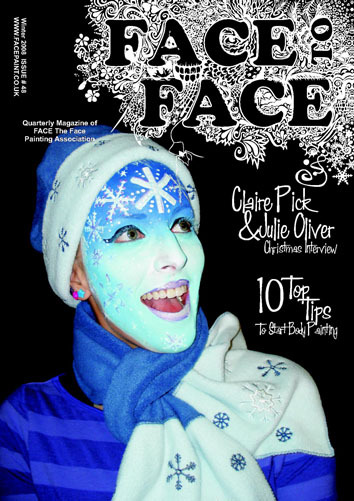 Oh, almost forgot… the film that I did the zombie make-up that I posted about previously is out! Here is the link Bar One/Walking Dead Commercial Have a look – it is pretty cool! 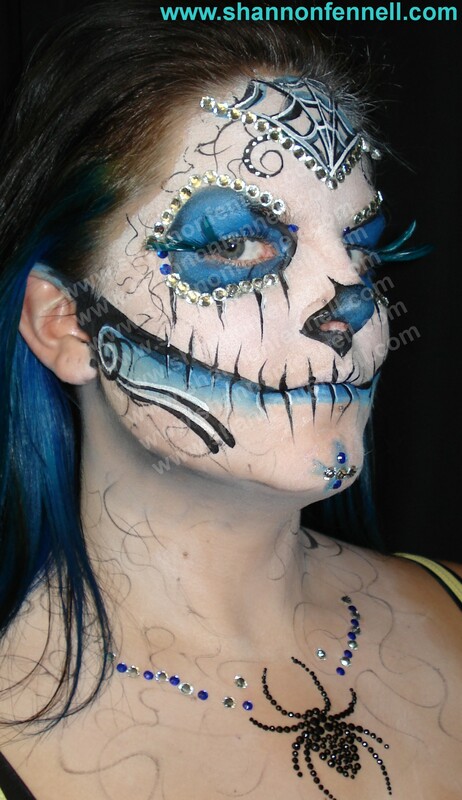 Categories: Body Painting, Costumes, Face Painting, Face Painting Designs, Make-Up Artist, Seasonal and Holiday Face Painting, Shannon Fennell | Tags: Alien make-up, Halloween, halloween make-up, Super hero make-up, Thriller, Zombie bride, zombies | Permalink. I love the smell of rotting flesh in the morning! Ah yes… it is the season for Zombies… desiccated zombies, bloody zombies, rotting zombies… all types of zombies! My season of individual Halloween make-up appointments actually started at 9 a.m. yesterday morning – a very early start this year. I actually have bookings over three weekends. I had four people yesterday, then late last night I got a message from a director – he needed two Walking Dead style zombies for a shoot today, and could I do them starting at 8 a.m. I didn’t have anyone scheduled for today (I was planning to bag leaves in the front yard) so said I could do it. I knew the actors from other shows. So the season is off to a good start I think. 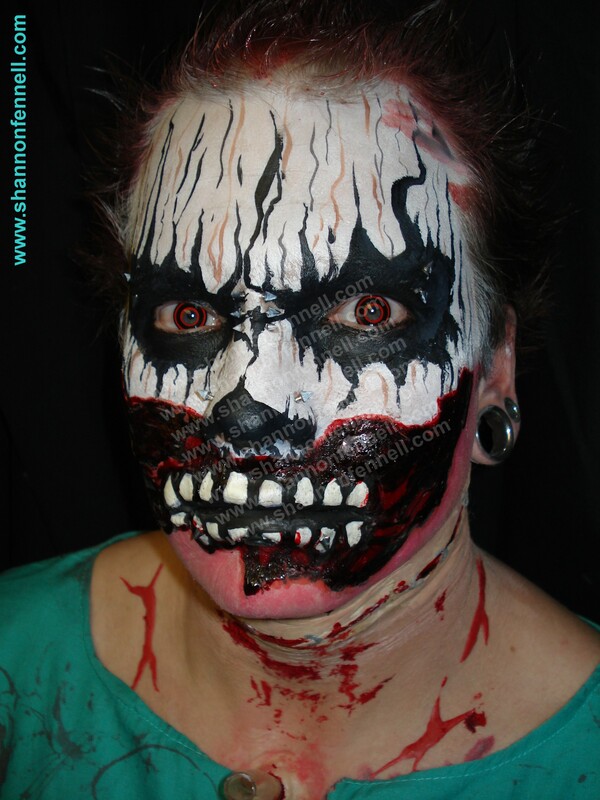 Categories: Shannon Fennell | Tags: halloween make-up, sfx, special effects make-up, Zombie make-up | Permalink.